IT IS interesting to see how sons, and even daughters, sometimes follow their grandparents into their trade or profession rather than that of their parents. Keith Ferris Barlow, of Ballina, was one such person. His grandfather, Joseph Barlow, was an engineer in Ballina for many years, mainly working at the Ballina Butter Factory and Bagot's timber mill. It is said that he also built small engines that could run milking machines. In an area without electricity, these engines were vital to an over-worked dairy farmer. Imports were expensive and the Barlow engine is said to have been a very good solution. Keith Barlow grew up in Ballina, the second son of Albert James (Bert) Barlow, Joseph's youngest son, and his wife Ruby Muriel (nee Waldron). He was born in 1926 and had three brothers and one sister. After leaving school he became a fitter and turner and as soon as he qualified he decided to establish his own business, a slipway and engineering works. Like his grandfather Keith was always looking to improve on a product, or to create a new one. At that time in Ballina the prawning industry was at its peak, and he found that building and equipping trawlers was a profitable enterprise. Other equipment built at Barlow's included winches for hauling the heavy prawning nets back on board. This equipment was sold not only to local fishermen but to fishermen throughout NSW, Queensland and Western Australia. Some equipment even found its way overseas. His firm, K F. Barlow Pty Ltd prospered through hard work and inventiveness. 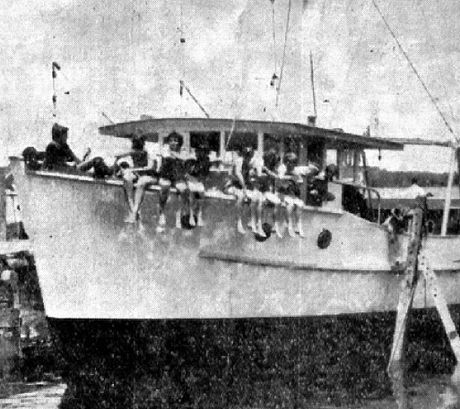 In addition to trawlers, Keith built several ferries for local councils. One of the largest trawlers built was sent to Western Australia. These were often equipped with extras invented by Keith. Fishermen would tell him of a problem and he would try to solve it. The journey home with their catch often took hours. Fishermen did not like the time wasted so Keith invented a gas cooker which could be used to cook the prawns on board while returning home. This meant the time had been spent profitably and the prawns were ready for sale immediately the trawler arrived back. It is said the winches caused a sensation among fishermen when they were exported to North Borneo. They had never encountered anything like them before. Barlow's did not deal exclusively with ships, however. It was a general engineering works and, as such, undertook several difficult jobs when major buildings were erected in Ballina. As the town is below sea level, piles are usually needed to secure the foundations. One major job was successfully driving the piles for the building of the RSL Club in the early 1960s. The site is near the river, which added to the problems as water seeped back into the foundations. Keith Barlow followed his father and grandfather on to Ballina Council. Like them he became mayor of the town (later the shire). He was always interested in improving facilities in his home town and, because of this, was also a very active member of Lions. Keith married Elizabeth Joyce (Betty) Henderson and they had four daughters, one of whom died in infancy. Betty was an able assistant to Keith both in his business and as mayoress. In later years the family farmed a property on the outskirts of Ballina. Betty died in 2009, Keith in 2010.